"Rest in peace JoAnn. I know you were a wonderful mother because I know your son Phil. I also know how much he loves you and how proud..."
"Love you Mom, I miss you more then words can say. 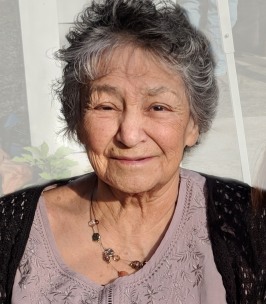 May you rest in peace.❤❤❤❤"
Joann Josephine Lank, 83, a resident of the Emmons Road, died peacefully surrounded by family on Sunday, January 27, 2019 at Gosnell Memorial Hospice House in Scarborough, Maine. She was born on February 7, 1935 in Yarmouth, Nova Scotia, the daughter of James Albert Labrador and Mary Rose Pictou. She married James Lank in 1961. She founded Joann’s Christmas Trees and Wreaths at Lank Farm in 1980, later to be named Lank Farm Trees and Wreaths. She enjoyed crafting, making baskets, showing her blue-ribbon miniature horses, and most of all spending time with her family. As Joanne would say, “I’m a Mi’kmaq from way back”. She is predeceased by her husband, James Lank, her sister, Lucy Labrador Croteau, and her brother Joseph (Sal) Labrador. She is survived by her loving children, Barbara Boisvert of Kennebunk, Robert Lank of Kennebunk and Phil Lank and wife Karen LoVerde of Arundel, grandchildren Jared Lank of Portland, Breanne Boisvert of Biddeford, Natasha Kahawaii-Dion of Kennebunk, Ellie Perkins of Arundel, Brandon Magno, of Kennebunk and great-grandchild Gino Sabatino. She is also survived by her sisters Linda Binnette of Alfred and Barbara Daney of Alfred and her brother, Larry Labrador of Arundel and many nieces and nephews. Public visiting hours will be held from 4-6 PM on Thursday, January 31, 2019 at Bibber Memorial Chapel, 67 Summer Street, Kennebunk where a funeral service will be held at 11AM on Friday, February 1, 2019. In lieu of flowers, donations in Joann’s memory can be made to the Animal Welfare Society, PO Box 43, West Kennebunk, ME 04094. To share a memory or leave a message of condolence, please visit Joann’s Book of Memories page at www.bibberfuneral.com.